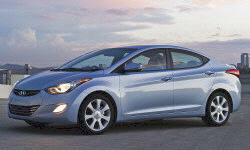 Why the 2013 Hyundai Elantra? Seats mold to your body and they heat up fast which helps in winter. Looks sporty with the black paint and tinted windows I have. The charging station and hidden compartment is great for your cell phone and charger. Why Not the 2013 Hyundai Elantra? WOW...I live in Alberta and we just had a snow storm go through. The roads are icy and snow covered and the handling of my 2013 Elantra has gone down hill. I have only 7000km but bought it with only 15 km on it. I have been driving for 25 years and this is the first car that I have owned that makes for a white knuckled ride. The car was drifting a foot to a foot and a half left and right on the highway and I could only get up to 60 to 80 Km/hr on a highway that people were passing me doing 100Km/hr. The equivilant to the drive to work today, was a car I had that needed tie rod ends, ball joints done and it had 350000 km's. I will be calling the dealer today to see if they can check the front end. I haven't had an accident or hit any curbs. The vehicle has only been driven by my wife and myself. I have the all seasons on that came with the car. Has everyone else put winter tires on to help with this issue? Am I the only one with this issue? Has anyone else had steering issues? If the handling was good then it would be a great car, so far.